Motorcycles, school fees, counselling, cash: Thomas Lubanga’s `kadogo’ (child soldiers) know what reparations they want from the International Criminal Court (ICC). Less clear is what a cash-strapped tribunal can offer damaged children taken from their families and forced to fight in a brutal ethnic conflict in northeastern Democratic Republic of Congo (DRC). “They expect something that will really help them to heal, to help them to recover from the loss of their childhood, their education,” said Bukeni Waruzi, an expert on child soldiers and the programme manager for Africa and the Middle East at NGO Witness. Lubanga was convicted in March on three charges of recruiting and using child soldiers in the military wing of his Union of Congolese Patriots in 2002 and 2003. His ICC trial heard that children as young as nine served as fighters and bodyguards. It was the ICC’s first-ever verdict, and the court is now heading into unfamiliar legal territory as judges must now decide on reparations for Lubanga’s victims. No other international criminal tribunal has ever awarded reparations, but under ICC rules, those who have suffered injury or harm from a crime for which someone is convicted could receive restitution, compensation or rehabilitation. “The [judges] will decide on Lubanga’s sentence, this is first step,” said Paolina Massidda, principal counsel of the ICC’s Office of the Public Counsel for Victims, which provides support to victims including legal representation. Under the ICC’s founding treaty, the Rome Statute, court-recognized victims are given lawyers and allowed to participate throughout a trial, including questioning witnesses. Luc Walleyn, who along with a Congolese lawyer represents 19 victims, doubts collective reparations would work for his clients - ex-child soldiers and their families. “Child soldiers are not a community,” he said. “It is not like a village that has been victimized. They are very often in conflict with their own families. I cannot see my clients as a group. They are really individuals. But experts warn that cash payouts are unlikely, and many will get nothing unless they can prove to the court that they were harmed by Lubanga’s crimes. Waruzi worries this will be disappointing to the former child soldiers who are largely uneducated and untrained. Many suffer from drug addiction or diseases including HIV. Others have been victims of sexual violence. He wants reparations that match the scale and scope of the crimes. On trial since January 2009 and in custody since 2005, Lubanga was declared indigent and given a legal aid lawyer. This will be reassessed by judges in the coming weeks. If he cannot pay for reparations himself, the court may turn to its Trust Fund for Victims which supports reparations from the voluntary contributions it receives from ICC members and others. In 2011 the fund’s total annual income was 3.2 million euros. It has ring-fenced 1.2 million euros for court-ordered reparations. Though his resources are “modest” and the number of ICC cases expanding fast, the executive director of the fund’s secretariat prefers to talk about meeting rather than managing expectations. But Pieter de Baan admits the fund has been keeping a deliberately low profile on reparations until the judges decide how the process will work. “Our plan is that once we have more information coming from the chambers on which direction they would like to go we will tailor the messages we will be sending out to communities,” said de Baan. 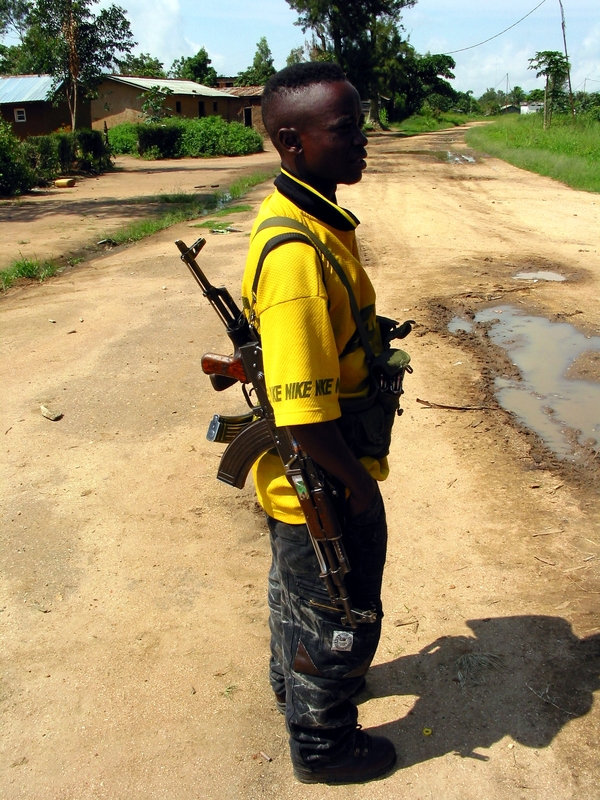 A young member of Thomas Lubanga’s rebel group in Bunia in 2003. Reparations are only one part of the Fund’s work. Operating under its General Assistance rather than Reparations mandate it has been on the ground in eastern DRC and northern Uganda since 2008 offering vocational training, trauma counselling, reconciliation workshops and reconstructive surgery to over 80,000 victims. This close contact has convinced de Baan that the best reparations are those that help people to get on with their lives. “They might like to have some sort of reparation that would acknowledge their victimhood and their dignity as human beings that allows them to rebuild their lives in a way that is meaningful and sustainable,” he said. Analysts agree, however, that reparations are a legal and social minefield. The potential problems - and solutions - are already filling pages of legal submissions to the judges. The registry also cautions against “ill advised reparation orders [which] may worsen the situation of former child soldiers by increasing the children’s stigmatization within their own community.” It also questions how eligible victims will be found as some have moved on from their villages. Carla Ferstman, director of Redress, a human rights group working with war crimes victims, urges the judges to consider the many existing rulings on reparations . They come from truth commissions and regional courts, including the Inter-American Court of Human Rights. But with so many potential pitfalls, there are fears that the reparations process could drag on as long as the trial. Walleyn says the former child soldiers he represents have become disillusioned after years of waiting.